I am on a quest to collect tasty salad recipes that can keep in the fridge for several days so I can just grab one to go with lunch. It’s one way for me to add more veggies to my day. I found this tasty recipe from the Moosewood Restaurant Favorites cookbook and it’s delicious. It is quick to make with a food processor. I like that it has olive oil and the honey and orange juice give it some sweetness. My husband and I both love this salad! 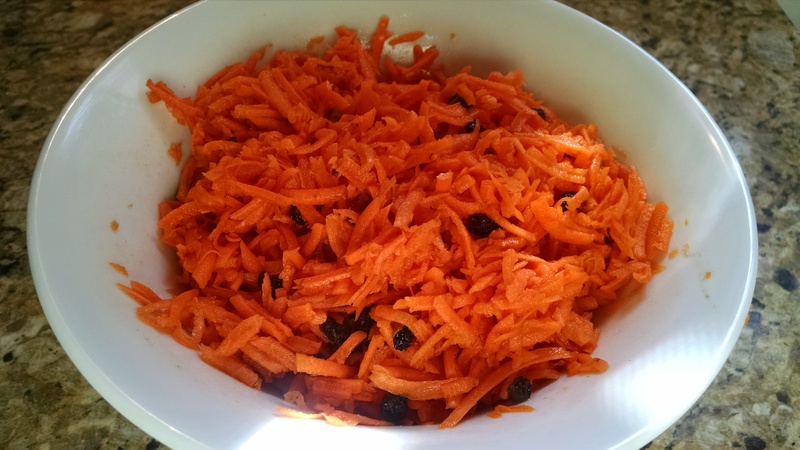 Peel one pound of carrots and shred them with a food processor. You can probably buy the pre-shredded carrots, but I think fresh probably tastes much better. Grate the rind of one orange and then juice. Add both the rind and juice to the carrots along with a tablespoon each of olive oil, lemon juice and honey plus 1/2 teaspoon cinnamon and 1/4 tsp salt. 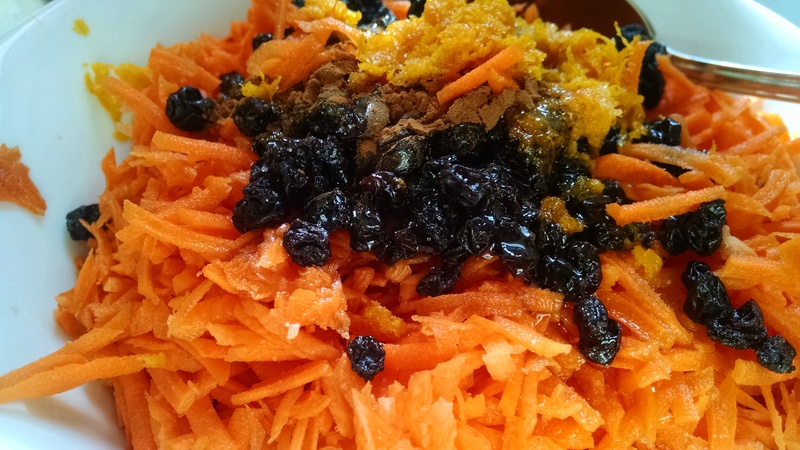 Stir in 1/2 currants and enjoy! Shred the carrots. 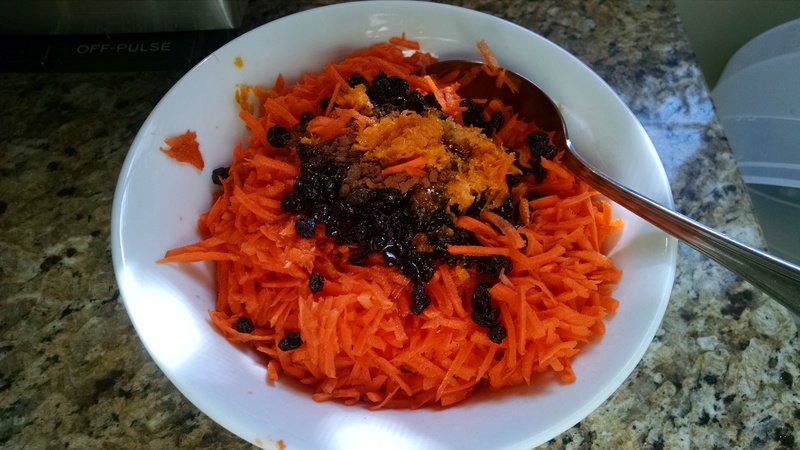 Zest the orange and add to carrots. Juice the orange and add. Mix the lemon juice, olive oil, honey, cinnamon and salt together and add to the carrots. Stir in the currants. This is one of my favorite standby salads. I usually can’t wait until blueberry season so I can enjoy it again. 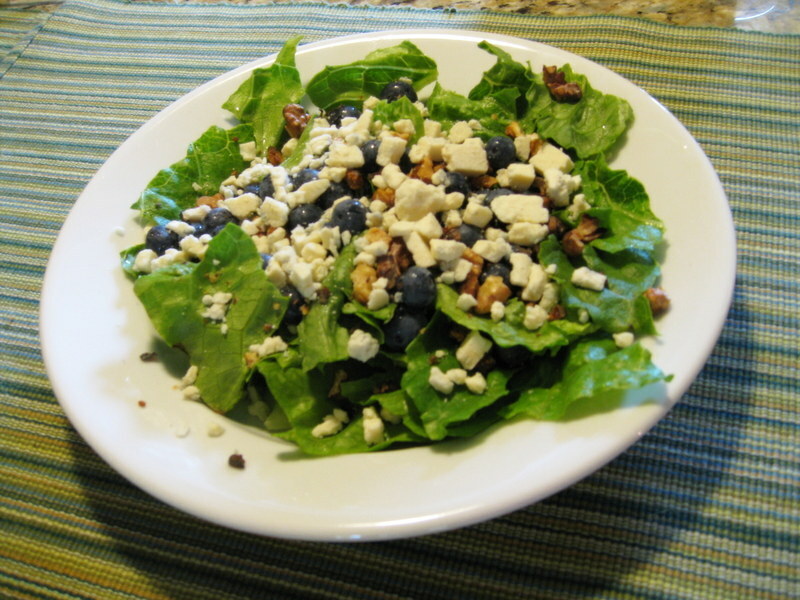 Place the romaine lettuce in bowl and top with remaining ingredients.